Tomorrow is Good Friday. The last Friday of Lent – where did the time go? 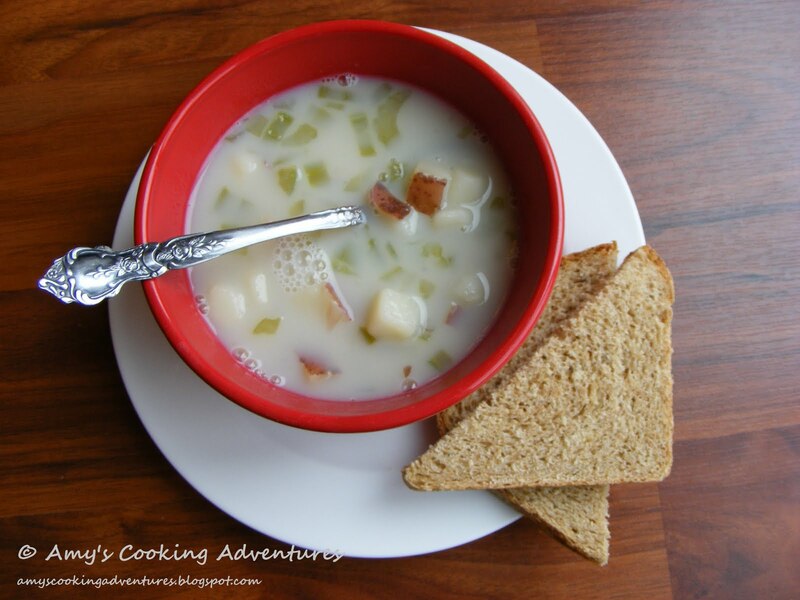 Since Good Friday is a fasting day, I am sharing a simple potato soup today. This potato soup is nothing like my last one with all of those baked potato toppings. This soup is based off of my mom’s potato soup, which was always a Lenten staple in out house. I started off with some red potatoes (I can get full size red potatoes in my area, so use your favorite potato) and didn’t peel them. I just love the added flavor and nutrients the skins add. The potatoes were boiled with celery and onion in vegetable broth for a little extra flavor. Then finished off with some milk to add creaminess. The vegetable broth made the soup salty enough for my tastes, but if you buy a lower sodium broth, you may need to add salt to taste. Served with a slice of homemade bread, this is a wonderful meal. Place the potatoes, celery, onion, and broth in a soup pot. Bring to a boil. Cover and reduce heat. Simmer for 30 minutes or until potatoes are tender. Stir in milk and salt (if desired). Heat through and serve.